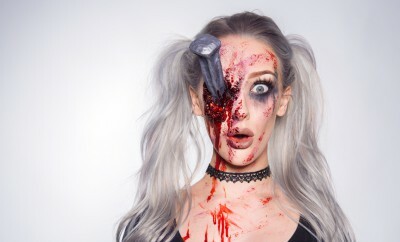 Create some wow factor by letting your eye be torn out! In this fairly easy tutorial you’ll learn how to create an eyeball and fake eyelids among other things. Nikon D810, Nikon D5500, Carl Zeiss 85mm f/1.4 Otus, Nikon 105mm f/2.8 MICRO VR, Final Cut Pro X, Apple Macbook Pro 15″ Retina. What will you do when you me her? I will run away and do not bother to look back. Haha.... Go to my channel to watch lots of interesting videos. When she try to shook her head,the eyeball went hanging. Funny. When i heard the music,i danced. Funny. I Need an assistant and I need a doctor & I need I need I I I! Another tip : you can use a ping pong ball! The latex is safe to apply on skin? "Or to throw at a sibling." 😂😂😂 Lucky for me my little sister is mostly quite sweet. Tasnim Meghreji you mean as a good way? Oh that's gross, my eye herts just watching this, gross man, she's so good at this. Hello might I ask if you guys have the transparent plastic? Or there's only solid color?